It’s interesting to remember, wherever we are on our journey, we never stop growing. Will Shakespeare once said: “Expectation is the root of all heartache.” Well my expectations unexpectedly blind-sided me last week. I had the great delight of speaking at Financially Fit Women’s lunch on International Women’s Day at Hever Golf Club, on a subject very close to my heart – the importance of taking time out. Afterwards I felt drained and disappointed in my performance. After some self-examination I realised that my expectations were off the scale. I was expecting myself to be a world class speaker and in reality this was only my fourth public speaking engagement. This opportunity was of course a step on the path of experience and like all of us I am still learning. Not so very long ago I used to suffer terribly at the hands of MY expectations. To add to the irony of the situation I had given a talk to a well-known women’s group on the very subject last year. So, even when we have made massive progress in different areas of our life we are often sent opportunities to test us. Like the proverbial onion we just keep peeling back the layers. I’m not sure the onion ever gets any smaller… our lessons and learnings just change, and more importantly our ability to deal with them. 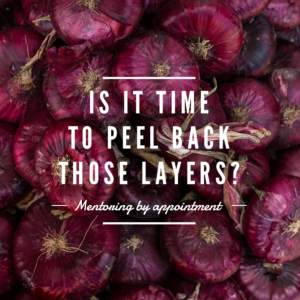 Is it time to peel back those layers? Have you ever considered mentoring? Remember that asking for help is a sign of strength. If you would like the opportunity to work with me on a one to one basis then I would be delighted to hear from you.